Description, biology and damage This is a serious pest of black locust. An attractive yellow and black long-horned beetle which can be seen on goldenrod and rabbit brush in the fall. In fall, the adults lay eggs in cracks and in wounds on the bark. Larvae mine beneath bark and in wood and can literally honeycomb the wood so that infested limbs are likely to break (with or without a wind). Pest monitoring Look for wet spots as sap seeps to the bark when larvae tunnel into the bark in spring. As larvae bore into wood, sawdust is forced out the entry hole. Keep trees vigorous with adequate water and limiting damaging agents such as animals. 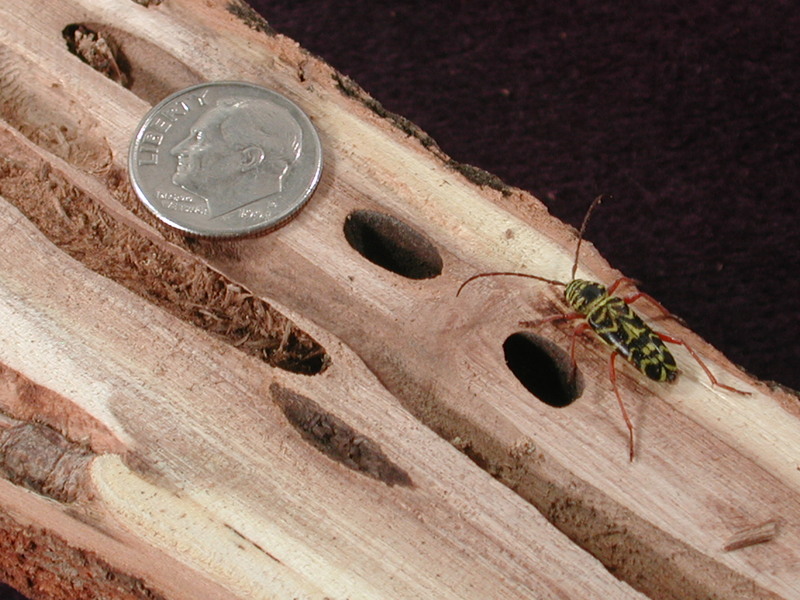 Remove weak or infested trees and grind or burn infested branches before beetles emerge.